I absolutely love Disneynature’s Earth Day tradition! In years past we’ve seen Earth and Oceans, and this year we get a live-action Lion King, only no one is singing “Circle of Life.” Directors Alastair Fothergill and Keith Scholey take us on a wonderful adventure through the eyes of two families – lions and cheetahs. 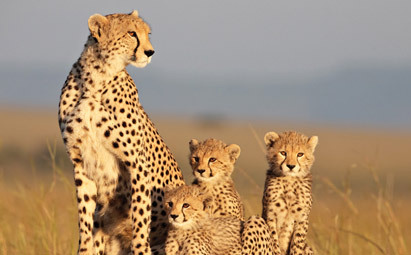 The movie, which took 2 ½ years to film, focuses mainly on the urgent challenges of the cycle of life in Kenya’s Masai Mara National Reserve. It was beautifully filmed with spectacular wildlife footage of lioness and cheetah moms protecting their young no matter what the cost. Meet Sita, a cheetah with five adorable newborn cubs, (omg, they were so precious) and Layla, an aging lioness who cares for her female cub Mara. Layla’s pride is ruled by snaggle-toothed Fang, an aging male who can still fend off a threatening crocodile or two, but has little fight in him when it comes to a stray male lion Kali, who, along with his four sons, aims to take his place in the pride. If Kali (who you really dislike from the very beginning) succeeds in taking over Fang’s pride, Mara and the rest of Fang's cubs will either be killed or driven out into the wild. Seeing this struggle take place is extremely intense, sorrowful and upsetting. Then we have Sita – a much less complicated storyline. Sita, being a single mom, has a lot more work on her paws. She’s not only responsible for raising/protecting her cubs, but she has to leave them unprotected when she hunts. The capture of a gazelle is cause for celebration, and the cubs' taunting of an unfortunate jackal is pretty funny. All seems well u ntil tragedy ensues and believe me, it almost brought a tear to my eye. Watching Sita defend her cubs against bigger and more numerous predators was awe-inspiring. With all the danger and risks these beautiful animals have/take, it really makes you wonder how any of them reach adulthood. It’s absolutely incredible. 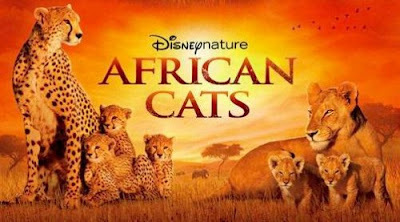 Even though this movie doesn’t teach you anything you don’t already know, African Cats definitely melts your heart. It’s touching, inspiring, intense and tragic. The breathtaking photography captures the beauty of the country and has a simple story that everyone can enjoy. It’s also an entertaining way to make a difference - during the first week of its release; a portion of the proceeds will be donated to the African Wildlife Foundation. After seeing what these lovable creatures go through each and every year, the price of a movie ticket doesn’t seem steep at all. Even though I thoroughly enjoyed this movie, the script and music could have been better. At times both were distracting.